Today I ran my first ever trail race, and though the path to get me there was bumpy at times — no pun intended, it was totally worth it. Train on the actual race course or the closest thing to it, especially if it’s different terrain than you’re used to. Start slow, no matter how great you feel. When you’re in that last stretch and you have the extra energy you conserved, floor it for a strong finish! 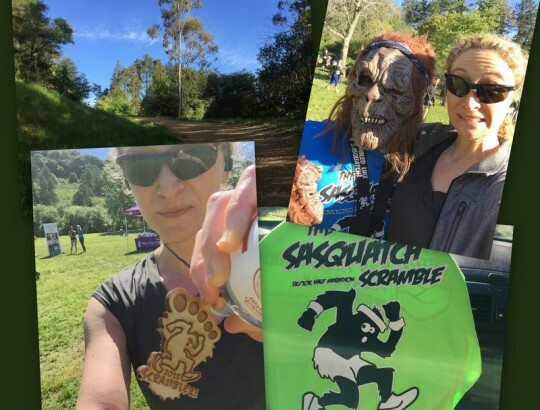 Check out Sasquatch Racing events if you’re in the San Francisco Bay Area – really fun and well organized at seriously scenic spots. I had never run a trail race, just a series of flat 5Ks and flat neighborhood jogs over the last few years. 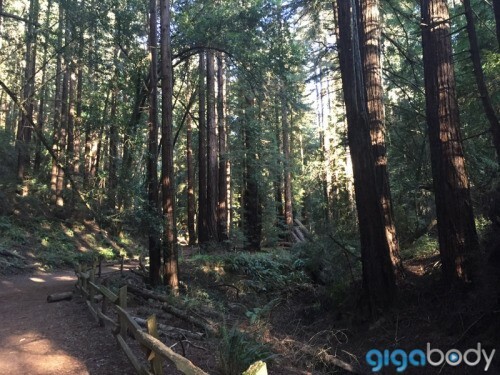 So when I heard about the Sasquatch Scramble, a variable distance 5K/10K/half marathon taking place at my favorite local park — Redwood Regional Park — I knew this was meant to be. I decided to shoot for the 10K, a distance I’ve run a few times in the past on my own, but never in a race and NEVER on trails. I got serious to prepare. The first thing I did was consult a marathoner friend, who turned me on to Hal Higdon’s training schedules online. My favorite part of his schedules is that he incorporates lots of other activities. I run a fitness video website, so I spend several days a week dancing, strength training, and mixing it up with workout videos. Then there’s walking my dog, riding my bike with friends, hiking, competing in a 500-pushup challenge for April and whatever else I feel like throwing into the mix. Higdon’s training schedule was perfect, 3 days of running per week, with 1 increasingly long distance day, plus other days of dedicated strength training, cross-training, and stretching. I started doing lots and lots of stretching while prepping for the Sasquatch race. This was unusual for my routine but incredibly restorative. Why haven’t I always stretched? Though I had only started running again in the last few months after a year-plus absence due to an injury, I found that my cardio endurance had not dropped much at all. All of my other activities — dance in particular I credit for the cardio — had left me in good enough shape that I was able to pick back up my old pace in just a couple months. Now, let me say that I am a SLOW runner. In actual races, I’ll clock in under 11 minutes. When training, I’m in the 11:15-12:15/mile category on good days. That’s just me. I have a lot of (particularly lower) body mass, pretty much the opposite of an optimal distance runner’s body according to the excellent book, The Sports Gene: Inside the Science of Extraordinary Athletic Performance, by David Epstein. Also, there’s my actual DNA. I learned a few years ago through personal genetics company 23andMe that I am a fast twitch muscle fiber girl. I had no idea this was the case, but it affirmed so many things for me. Like why I struggled so much with cardio and endurance activities, but had an affinity for anything short and bursty like strength and interval training. That’s not to say I don’t engage in cardio and endurance, clearly, it just helps me embrace my best performance for whatever that is rather than mercilessly comparing myself to others. Marathon Matt, the founder of Sasquatch Racing, gave me the course “cheat sheet” on the Facebook page, and I decided to train on the actual course. Perfect opportunity to get back up to my favorite park at the start of the season, to breathe in fresh air and redwoods, and of course, to bring my dog along. The first visit was a 4-mile day on my schedule so I did the whole 10K course, walking the extra couple of miles at the end. It was a gorgeous course, and I went and blew all my energy running the long uphill on the first half. HUGE lesson there. I thought running slowly would be enough (like hiking slowly uphill, right? ), but no, it actually just burned all of my extra energy when I had miles left to go, and I was worn out by the time I hit the halfway mark at the top of the climb. Thankfully, I’d brought some trail mix which is something I never normally do when training. That made a huge difference…well, that and stopping to eat it for a recharge. 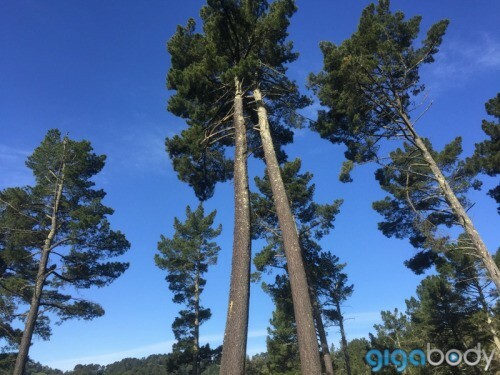 The following week, I felt so invigorated that I did more hiking even before I visited Redwood Park to do the course for the 2nd time. Long story short, my chronic knee injury flared up due to the stress of repeated descents and almost sidelined me completely. I begrudgingly realized that I could not complete the 10K in a matter of weeks. 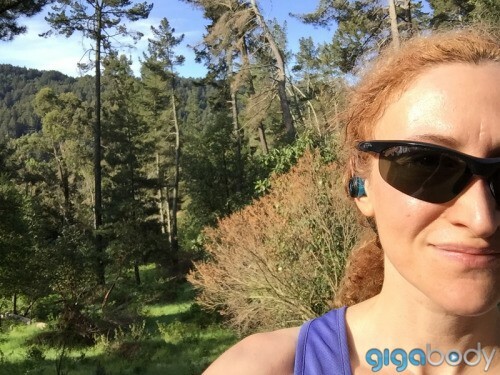 But still, I had learned the course, proven to myself that my heart, lungs, and muscles were in plenty good shape for a full 10K, and had spent quality time in my beloved California Redwoods. In other words, I was more than ready to kill it on the 5K. Before the race, a couple friendly folks from Sweat Republic gave us a little dynamic stretching warm up. Then we were directed to queue over in the starting position. I happened to be very close to the area, so I chose a spot that should have been in the middle/back, knowing that my pace was a pretty slow one historically at races. Oddly, almost everyone got behind me for some reason. A group of people standing near me started talking about how they didn’t want to be in front because they weren’t fast runners. In other words, they felt just like me. That was an aha moment and boosted my confidence just in time for the race. So the race started, and I kept it slow. It was only a 5K, but I decided to deliberately hold myself back at the start and save my energy for later in the race as I’d heard my friend mention as a marathon technique. Sure enough, a bunch of people shot ahead of me in an almost sprint, and not much further ahead, several of them dropped back to an exhausted, walking pace. I kept it slow and steady, although definitely a little faster than a normal training day because of the excitement and nearby bodies. I paced myself with a girl I’d heard mention an 11-minute mile, and settled in behind another set of lean, early 20-something girls. As the race went on, I employed several techniques I’d learned in the 2 training runs on the actual course. Don’t run on long uphills, not even a little, conserve. Go slowly on long downhills, and listen to my knee the whole way. And one technique that just came to me instinctually and really worked! Clearly a byproduct of having conserved my energy at strategic points. When a surge of energy occurs in the latter half of the race, use it! I truly felt my energy building with my endorphins as the race progressed. I passed the 11-minute girl, then the group of younger girls, then a bunch of other people who’d easily flown past me at the start. What a cool feeling. I decided to give it my all for the last mile to the finish. I knew I could have run twice as far today and I knew the actual course pretty well by now, so I could visualize myself sprinting through that finish line. So that’s what I aimed for. I dropped my last mile pace by almost 2 minutes/mile and when they cheered for me crossing the finish line, I felt really, really proud. I’d done it. With all the ups and downs of the previous month, I had made the best of it and had run a great race. I clocked my 2nd best time ever in Runkeeper. Not bad for my first trail race. Note: I received a free race entry to the Sasquatch Scramble through my #SweatPink affiliation. However, I call a spade a spade. I was truly impressed with the quality & organization of the event.